This new Van der Valk hotel in Apeldoorn will open its doors in early 2018.The 151-room building has an area of ​​about 20,000 m² and consists of a tower and low-rise building. It's exceptional façade construction, gives the hotel his stately appearance. 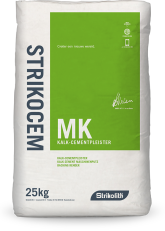 The application of hundreds of square meters of Strikocem MK lime-cement plaster were directly applied from a silo instead of bags, this caused a huge time gain!